Last year on a bright Sunday morning on the 28 August, the Deputy Minister of Social Development, Honourable Hendrietta Bogopane- Zulu, convened a girl’s assembly in the rural Mareetsane village of the North West. The girl’s assembly was aptly convened in a municipality where a record number of about 3000 girls, some as young as 11, are pregnant or have given birth to one or more children. Honourable Hendrietta Bogopane- Zulu on April 4, 2017 paid a visit to UNFPA in Pretoria to continue the discussion initiated in Mareetsane. She briefed the Representative and the country team on Progress with the girls. It is amazing what she has done with her team and the local Municipality leaders and the results they are achieving! As a key partner to government, supporting interventions that improve the quality and utilisation of sexual and reproductive health services, including services for maternal health, family planning and HIV prevention efforts, the Deputy Minister visited UNFPA offices to further discuss interventions for engaging young girls to help them live their dreams and have their Rights fulfilled as they grow. To date she has worked with other leaders on the ground to initiate initiatives to ensure that the girls residing within the Ratlou municipality are able to access comprehensive information and services available to them, including family planning, HIV counselling and testing, breast & pap smears examinations, access to positive parenting and alcohol & drug literacy programmes. She has set up Early Childhood Development centres (ECDs) so that girls have somewhere to leave their babies well taken care of to go back to school and others engage in gainful economic activities. As the municipality has a population of 107 339 people, documented unemployment rate of 43.9% and youth unemployment rate of 52.4%, it was delightful to hear that the department of social development, together with private sector partners, have established an economic empowerment bricks-and-blocks making machine initiative. The aim is to benefit local cooperatives and community members, especially women to make bricks, construct their own houses and create job opportunities in the local area, as most residents rely on casual jobs or social grants. 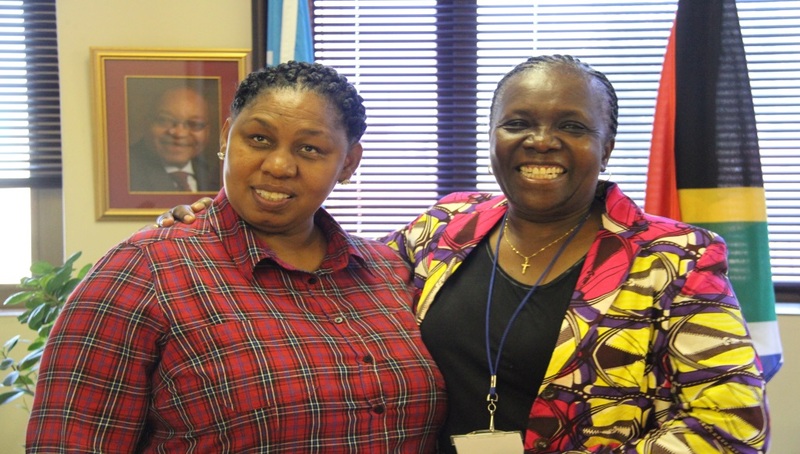 Left to right: Deputy Minister of Social Development, Honourable Hendrietta Bogopane- Zulu and UNFPA Representative, Dr Esther Muia. It was alarming that of the population aged 20 and older in the municipality, 24.6% have some level of secondary schooling, and only 11.2% have matric; 28.9% of people have no schooling and 26.9% have some level of primary schooling. On completion rates, 5.3% completed primary schooling and only 3.1% have some form of higher education. In an attempt to ensure the young pregnant girls go back to school after giving birth, it was mentioned that three Early Childhood Development (ECDs) centres have been established, meaning that this will go a long way in keeping the girls at schools. 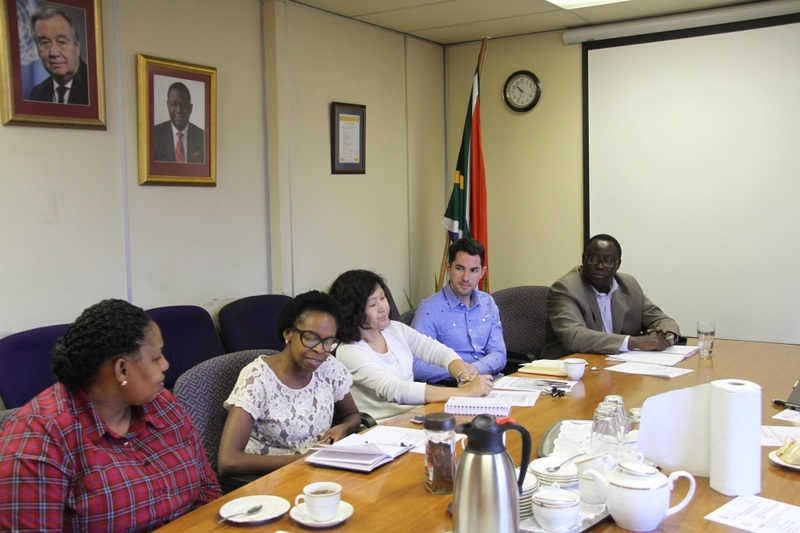 The Deputy Minister engaging with some of the UNFPA programme staff. The other key update the UNFPA team was happy to learn about was the mentorship programme that was initiated to ensure peer-to-peer learning takes place- for instance, pairing pregnant girls with non-pregnant girls from the same community to share experiences and learn from one another. As UNFPA we will be instrumental in helping these girls become the mentors they never had. As the engagement concluded the Social Development Deputy Minister and UNFPA Representative committed to working together and both looked forward to a continued fruitful collaboration, particularly on empowering girls by giving them a chance to participate in decisions that affect them at home, at school and in the community at large to build healthy, economically and socially empowered resilient girls!